So it has become official I am becoming terrible at remembering my weekend round ups. I am going to go ahead and pass the blame for this on over to school. I swear I try just with an exam or test literally every other day my mind has been going there as opposed to doing a weekend round up. I know it isn’t really the best excuse but it is all I got. This will be my last weekend round up and then I am going to be mixing up the format a little bit so that I am less likely to forget or skip a Monday post. I am actually pretty excited for the new Monday format and I hope that you all enjoy the little refresher. Anyways, my weekend round up. Well this weekend was another busy one but not quite as nutty as the week before. We had some beautiful weather so I was in the garden and doing some spring cleaning outside before some beautiful April showers took over for the rest of the weekend. I love cleaning out my garden after a winter of that awful white stuff. I make me so excited to see the blooms and smell the lavender. I also did my regular yoga teaching, yoga going, and went on my first outdoor run of the season. I am still starting off pretty slow for the running because my back isn’t quite at 100% still so I just went on a calm 2km loop with my husband to test things out. Besides some slight stiffness I would say that I am definitely getting there and will hopefully be back up to my regular 10km runs in no time. After my Saturday afternoon running around, I spent most of my Sunday snuggled up on my couch reading and studying for my Monday morning final exam. 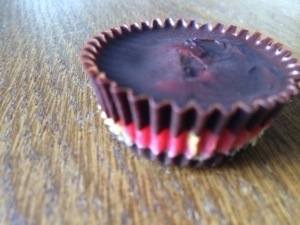 But in all the studying and reading I found the time to take a little break in the morning to make these delicious treats….PB&J Cups (recipe will follow later this week). 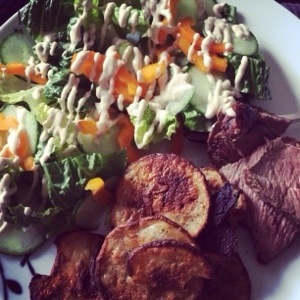 Then Sunday evening my husband and I sat down to a tasty healthy filled dinner of roast beef, homemade potato crisps and a salad with my new favorite homemade tahini dressing. It is my new favorite because I don’t really eat creamy style dressing but this one is vegan so no belly ache from dairy for this girl. Then I ended the weekend with some kitten cuddles. 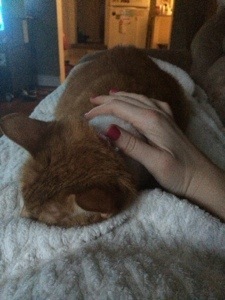 My little orange guy (Morris) has some hot spots and has been going to town on them so he is on another dose of medicine from the vet. We are hoping this will get him all cleared up. All in all the weekend was pretty great. Felt so very short but it was great. Hope you all had a great weekend and a great Monday. Keep your eyes peeled next week for our new Monday installments. This entry was posted in General and tagged books, decisions, flowers, garden, last, learning, new, recap, school, soring shower, symptomology, weekend, yoga by healingginger. Bookmark the permalink.